It’s Shameless Self Promotion Month! 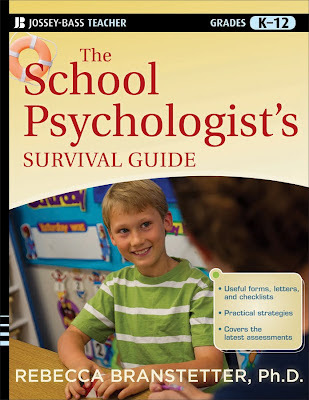 I promise, there will only be 75 more posts, tweets, and Facey Face status updates about my new book, The School Psychologist’s Survival Guide. I can’t help it, I am so excited that my book baby was finally born! It took longer to make this book than it did to make my actual baby. I wish I was Oprah so I could (as one reader put it), give out a copy to everyone and yell, “EVERYONE GETS A COPY!” I would totally put them under people’s chairs at NASP if I had Oprah money. I would probably put it in a gift basket with other survival tools, such as pens, pencils, energy bars, coffee, margarita mix…oh wait, cancel that last one. Not appropriate for work. • What do I do when a principal calls me and tells me there’s an emergency at my school and asks me what to do? • How do I delicately explain to a parent that their child has Autism? A Learning Disability? Emotional Disturbance? Isn’t eligible even though she is not meeting standards? • What do I do when a staff member “goes rogue” in an IEP meeting and disagrees with my testing? • How do I handle a group counseling session that turns into a WWE wrestling session? • What do I do if a kid tells me she is suicidal? • How do I find a space to work in that is a) not a janitor’s closet full of toxic chemicals, b) an old elevator shaft, or c) shared with 8 hojillion people with no privacy? These questions and more are covered in my book! It’s like having your own emergency go-to guide for the sticky situations we all encounter as school psychologists. And we all know it’s crazy season right now, trying to get everything done before the end of the school year, so couldn’t you treat yourself to a little something something off Amazon.com? Yes, I believe you could. Also, know that proceeds for the book go to a good cause: Baby B’s preschool fund. Turns out one year of PreK is as expensive as all four years of my college education. Who knew!?! I just know you all support early childhood education, so order now! *The BEST “Thanks! wave” of all is a review on Amazon.com. Um…erm… *shuffles feet and looks at floor* if anyone wants to write a review, I’ll be your best friend. Comments on It’s Shameless Self Promotion Month! Got my copy a few days ago. I haven't even been to my first school psychology class, but I figure I could read this and be prepared to ask and answer questions as I wade into the field. I'll do my review on Amazon, too! PS: My son started a Montessori program as he is too young to do the district's early childhood program because his birthday is "late" (didn't turn 2 by Sept. 1st). It is EXPENSIVE so good for you for raising those proceeds! I got my copy on Thursday!! Just in time, as I am in the process of starting to apply for my first real deal School Pysch job and have been contemplating- do I really want to venture into this world of school psychology insanity?! Thanks for making a book and blog that I am sure will be my go to resource many times to come! P.S. I am starting to master the art of describing the position- without having someone sum it up to a counselor, therapist or teacher's aide… though I probably can't yet do it within a few floors of an elevator ride..yet! I love how you prepare newbies for the reality of ambiguity in the school psychologist position. I shadowed a school psychologist for several days. Her office was in the ticket booth of the school's theater. She was at the school twice a week. Students sent her cryptic emails about needing to speak with her due to anxiety (but she never did counseling), parents insisted that their students see the psychologist instead of the social worker (which is who did all the counseling), teachers stopped her in the hallway with requests to stop into their classroom for problems with x,y,z, but, since she was only there twice a week, she had to somehow fit classroom visits in with her stack of report-writing, testing, and meeting after IEP meeting. The day I sat with her in that ticket booth and watched her work, I immediately wondered if this was for me! Anyway, I am enjoying your candor in how flexible one has to be in this field, and the huge importance of not being a stranger and a blur running in and out of a school without trying to build rapport with staff and teachers. In my city, school psychologists may be seen as interlopers from the district trying to tell veteran teachers how to run things. I'm just happy you put so much focus on being a known entity, a helpful person, and a resource to support teachers instead of a source of antagonism. I'm still going into the field. But, I am extremely happy to know so much about the field in advance of my first practicum. My review of this awesome resource is up on my blog now! Provided you're fine with it, I would be glad to send it to the publisher for promotion on their end. I truly loved this book. Thank you so much for giving me the opportunity to read and review it! It is simply FANTASTIC! I just received my copy today!! I am beyond excited to get to reading it once school is over. As an undergrad preparing for the GRE and grad school apps, I am looking forward to finding out what the future has in store. I've just purchased two copies of your book- one for me, and one for my practicum student. So far, it's great, but I have a question- page 97 mentions a parent survey form, but it doesn't seem to be included. Am I missing something? Thanks again for a practical, well written book!